Annual Dinner Gala at the Tribeca Rooftop on Tuesday, Dec. 4. In recognition of their contributions to ensure diversity and justice in the judicial system and the community, the Foundation, in conjunction with The Judicial Friends Association, posthumously honored Court of Appeals Judges Hon. Sheila Abdus-Salaam, the first African-American woman named to that court; Hon. George Bundy Smith, a stalwart of the Court; and Hon. Sandra Townes, the first African-American woman to serve in the U.S. District Court for the Eastern District of New York. Two out of seven scholarship winners (from left), Kennesha Allums and Ibrahim Diallo; Hon. Verna Saunders, chairwoman of the scholarship committee; and Hon. Ruth Shillingford (left). Administrative Judge, Richmond County, the first African-American to be so designated; and Hon. Kathie E. Davidson, the first African-American named Administrative Judge, 9th Judicial District. Finally, the organizations awarded the 2018 Commitment to Justice Scholarships to Ibrahim Diallo of Columbia Law School and Kennesha Allums of CUNY Law School, who also represented the five other winners, Ehiguina Borha and Alea Robers of of New York Law School; Shania Felix of Pace Law School; Julian Martinez of Hofstra Law School; and Genesis Sanchez-Tavarez of Columbia Law School. From left: Hon. Cheryl Gonzales, chairwoman of dinner committee; Hon. George Silver; Hon. Edwina Mendelson; Hon. Lawrence Marks; Hon. Kathie Davidson; Hon. L. Priscilla Hall; Hon. Tamiko Amaker; Hon. Desmond Green; Hon. Rowan Wilson; Hon. Alan Scheinkman; Hon. Rolando Acosta; Hon. Ruth Shillingford; and Hugh Campbell, Esq., president of the Foundation for the Judicial Friends, Inc.
From left: Hon. Ruth Shillingford, president of The Judicial Friends Association, stands at the podium with officers Hon. Erika Edwards; Hon. Sylvia Hinds-Radix; and Hon. Craig Walker; and Board of Directors members Hon. Cheryl Chambers; Hon. Verna Saunders; Hon. Dena Douglas; Hon. Abena Darkeh; Hon. Genine Edwards; Hon. L. Priscilla Hall; Hon. Robin Sheares; Hon. Paul Wooten; Hon. Ulysses Leverett; and Hon. Kathy King. 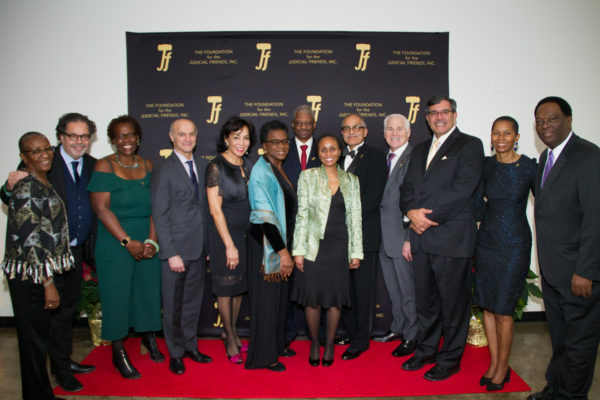 Established in 1981 and named in honor of the first three African-American Judges elected to office in New York state, this event is now an annual affair sponsored by the Foundation for Judicial Friends. Judges James S. Watson and Charles E. Toney were elected to the Municipal Court of the City of New York in the general election of 1930 and took office in Jan. 1931. Both judges served with distinction in that county for two decades. Judge Toney retired in 1951 and Judge Watson resigned in 1950 to become the president of the Municipal Civil Service Commission of the City of New York. Judge Francis E. Rivers was elected to the City Court of the City of New York in 1943 and was re-elected with tri-partisan support to a second 10-year term in 1953. He was certified to serve as Acting Justice of the Supreme Court in 1953 and retired in 1963. He was the first African American to become a member of the Association of the Bar of the City of New York. Judge Rivers also served as president and president emeritus of the board of the NAACP Legal Defense and Education Fund. Three judges were honored posthumously, including Hon. Sheila Abdus-Salaam, Hon. George Bundy Smith and Hon. Sandra Townes. The gala attracted some of the biggest names from the Brooklyn judiciary.